She was of sound mind and body until the last 2 weeks of her life. After a brief illness, she passed away Saturday, March 18, 2017. 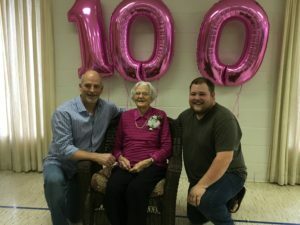 My husband’s grandmother “Rene” lived to be 101 years old. Rene was the type of person everyone knew and loved. She always made a phone call to each of us on our birthdays and special occasions. She wrote us letters, and when the children were young she would have a note tucked inside the envelope for each one of them and they were always specific to what was happening in their lives at the time. “Cody, how do you like 2nd grade. ?” “Loren, are you making friends in middle school?” and “Holli, did you enjoy your field trip last week?” You always knew she loved you and was genuinely interested in your life and how you are doing. Most recently, (one week before she passed away) Rene asked me, “Angie, well how do you like your new job?” I said, Rene, I love my job. She smiled and said, “I’m so happy for you.” She meant it. Rene was the matriarch of the Foree family. She had been a widow for 40 years and lived alone. Despite this, she seemed to always have a constant joy in her mind and in her heart. Rene wasn’t concerned with social media, the Internet, or any ‘program’ on TV after Wheel of Fortune. Her furniture hadn’t been update or replaced in years and she could care less about owning a computer. She did understand the importance of these things in other peoples lives, however, for Rene, she was happy living simply. After the funeral, the grandkids went through some boxes of memorabilia and found a stash of letters she had written to her husband, many years ago. They were sweet love letters that updated him on the children and how much she missed him. 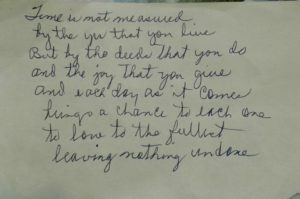 I don’t know if she had written them after he passed away or if he was on a trip, but her words connected her to him and thats what mattered. Rene also journaled. When her first great grandchild was born she wrote about her in detail in her journal. When you read it you could feel her pride and love for this child. There was an endless amount of letters and momentos Rene held onto over the years. She was asked by one of the grandkids years ago, “Rene, what are you going to do with all of these things?” Her response, “Oh, y’all just have fun going through it when I’m gone.” I believe they will. The old adage is quite often true, you don’t know what you have until its gone. I think we thought Rene would be with us forever. She was such a constant in all of our lives that we just felt she would always be there. Now that she’s gone, there is this huge void that will forever exist. Born durning WWI and having lived through WWII, Rene knew that the many blessings were found in each other, not in objects. She knew what mattered and what didn’t. She was unchanged by an ever changing world and she was steadfast in her love of God and family. God blessed her tremendously and then he took her home. At the graveside service, her first born great-granddaughter ready the following poem that was written by Rene. I think this sums up how Rene lived. Who Will Write the Letters? There is nothing like receiving a handwritten letter. That is one of the things we will all miss the most from Rene. Who will write the letters now? Well, I think I will begin, and I challenge you to do the same. Write a letter weekly to someone you love and watch how your words connect you to them. Maybe not now but sometime in their lifetime those letters will be the tie that binds, from their heart to yours.